The Tambo name is synonymous with integrity, humility, selfless leadership, patriotism, courage and conviction. They dedicated their lives to the struggle for a democratic South Africa – one in which all would be treated as equals and reap the benefits of a free and fair democratic dispensation. 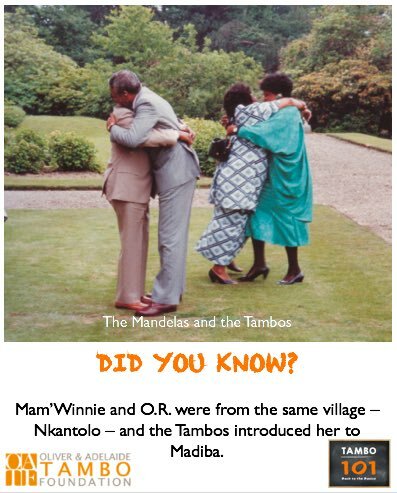 The Oliver & Adelaide Tambo Foundation presents the Tambo101 Campaign to honour O.R .Tambo’s 101st year, and use his memory to galvanise South Africans into espousing the values that made him the outstanding, committed leader that he was. We believe that these values, such as collective leadership, humility, integrity, justice, equality, and pan-Africanism, are critical in consolidating our democracy and providing future leaders with the tools to reinforce the gains made by Tambo. Established in 2011, the Foundation is a Public Benefit Organisation (s18A) that relies on donations in order to protect, preserve and promote the legacies of Oliver and Adelaide Tambo, and carry out the programmes that we undertake. Should you wish to make a donation to the Foundation, or sponsor one of our programmes, please fill in the form below. @NalediPandor @aishapandor @alenribic @pandorsuraya @UPTuks Congratulations, Minister Pandor!